Just One Night by Gayle Forman - WARNING! I cannot review this book without spoiling the others in the series. Read no further if you're planning on reading this series and don't want it spoilt for you. Everything will happen in just one night . . .
After spending one life-changing day in Paris with laid-back Dutch actor Willem De Ruiter, sheltered American good girl Allyson "Lulu" Healey discovered her new lover had disappeared without a trace. 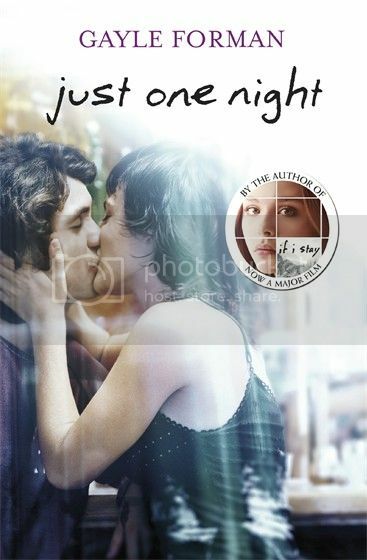 I stumbled across Just One Night by Gayle Forman accidentally as I was looking for another of her books on Goodreads. My thoughts on seeing the title were something like, "WHAT?! There's another book?! How did I not know?! Whatisit, whatisit, whatisit?!" So I clicked, and discovered it's a e-novella that finishes off the story from Just One Day and Just One Year. And it's so good! Just One Night starts right where Just One Day and Just One Year finish off - after Allyson enters Willem's flat after finding him. And there the story continues. They kiss, they talk, and everything comes together. How they've both been looking for each other, the near misses, Allyson's letter to Willem, and all the accidents. It's so ridiculously sweet, and had me wanting to start reading Just One Day again. It is quite a short novella, so for the most part, we get summaries of the conversations they have, and I would have liked to see a bit more of those conversations, the surprises as the two realise that the other was looking for them as much as they were. But it's great how it's told in third person from both perspectives, with each character's internal reaction following the other. It's awesome to be inside their heads again, to see how much they mean to each other, to see how much love they feel. And the meeting! Friends of each meet each other at a big meal, and they all talk about what they know of the two's story, of them trying to find each other, and it's just so lovely! Like in Just One Day and Just One Night, there is a lot of emphasis on accidents and fate, if they had done just one little thing different - if Allyson hadn't met Wren, who suggested she go to Parisian hospitals to ask about Willem, if Willem hadn't walked into the bookshop where he found out about auditions for Twelfth Night - they wouldn't have found each other. It's just wonderful. And the ending is so unbelievably gorgeous! You cannot read that last part of the story without aww-ing because finally! And all the love! It's just beautiful! And the very last two pages are so heartwarming! A really wonderful novella to finish the story off. Loved it!